I’m a huge fan of the original Dragon Quest Builders, so the second entry in the spinoff series, Dragon Quest Builders 2, came naturally to me when I got to go hands-on with it at PAX East last weekend. 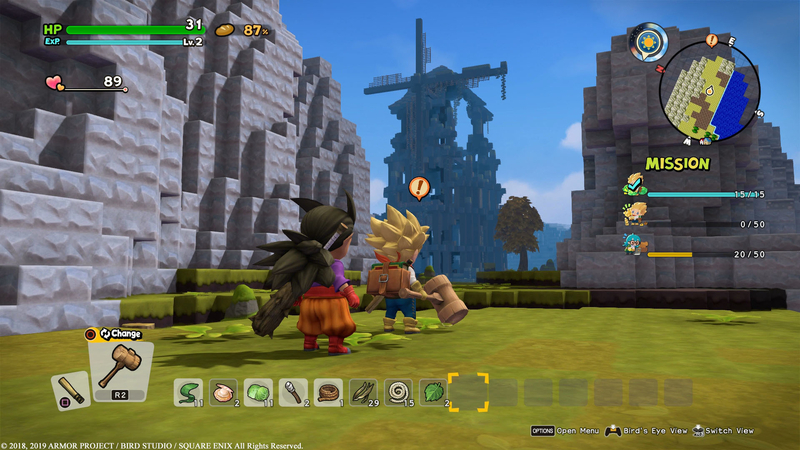 Dragon Quest Builders 2 makes some solid improvements to its Minecraft-like formula while retaining what made the first entry so lovable. Fans have plenty of reasons to get excited for Dragon Quest Builders 2 when it launches later this year. 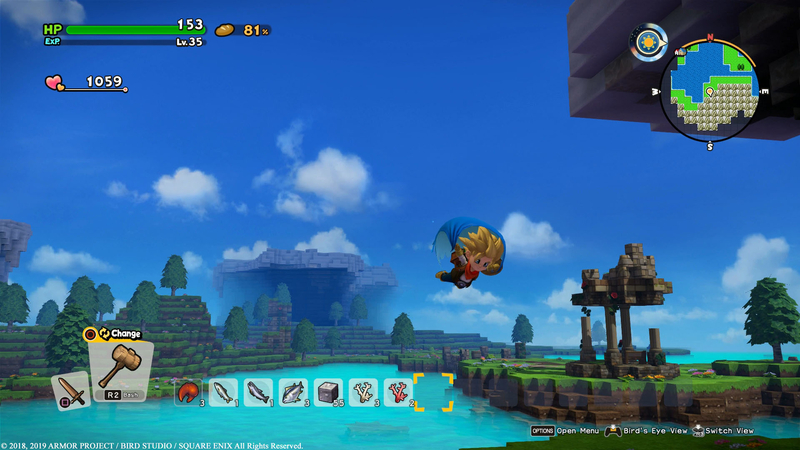 The first thing I noticed when I dropped into the world of Dragon Quest Builders 2 was its impressive scope and scale. This is a notably bigger world for players to explore, with more detailed environments, monsters, tools, and towns. Everything is given a shinier coat of paint while still holding onto that blocky charm fans have undoubtedly come to love. Additionally, players are given a map in the top right corner of the screen that pops out a lot more, with a retro-inspired art style really capturing that classic Dragon Quest charm. It’s certainly a step above the first in terms of presentation, and this new world is just begging to be explored. 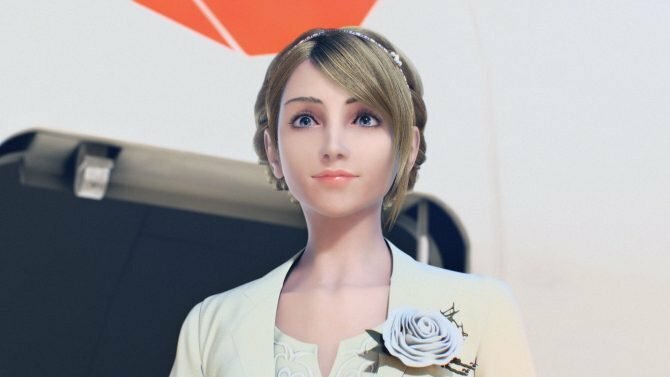 I can only hope that Square Enix has sprinkled a lot to find throughout. A quality of life improvement that’s worth talking about: your tools and weapons are now allocated to two separate buttons. 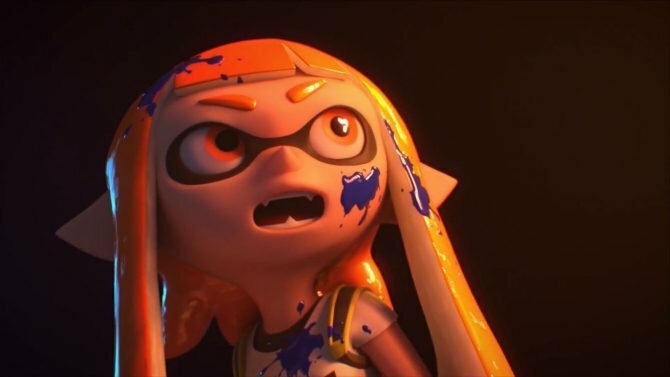 This means you can have your hammer equipped to one button and your sword equipped to another, completely tossing aside the cumbersome and oftentimes dangerous process of scrolling through weapons and tools with the d-pad to get what you needed in a specific situation in the original game. In the first game, this process could often result in damage taken at best and death at worst. This small improvement makes the gameplay feel all the more pleasing as I don’t have to worry when I’m suddenly attacked by a monster in the midst of building or gathering. Towns are better than ever given the game’s shiny new graphics. Upon just completing my first quest, I had already seen a lot of new things that I never experienced in the first game. It all works to improve the gameplay loop in small ways, but ways that nonetheless make the overall experience feel more intricate and that much deeper. The prospect of where you’ll be able to go, what you’ll be able to do, and what hasn’t been seen yet is truly exciting. And that’s not even mentioning the game’s multiplayer. Dragon Quest Builders 2 might be one of my most anticipated titles right now. I certainly am a bit biased though, as I have roughly somewhere in the ballpark of 100 to 200 hours with the PS Vita version of the first. 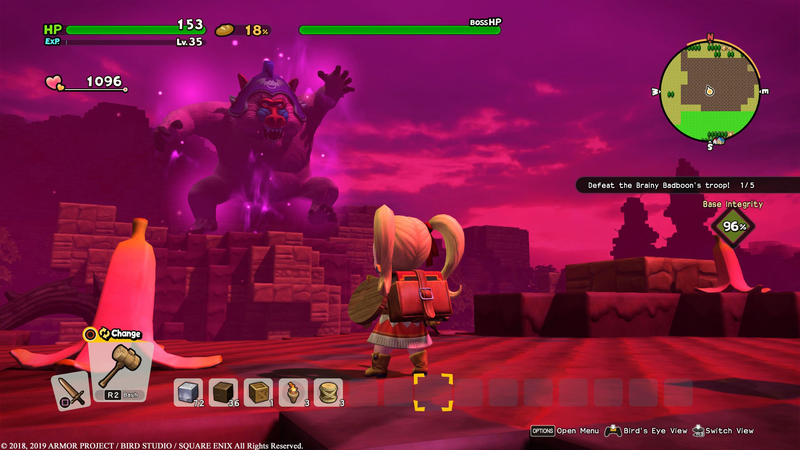 As for the multitude of other things you’re probably expecting in Dragon Quest Builders 2…well, I wasn’t able to sink my teeth into those things as much. Combat was never one of the spinoff series’ strongest points when comparing it to other things in-game. Enemies didn’t seem too intricate by design in the first Dragon Quest Builders, so I’m hoping to see some really wild monsters in the second game. Alongside exploration and building, hunting monsters with friends online could really prove to add so much more depth to an already deep game. The camera was a bit jarring at times in the first game. And thankfully, Square seemed to take notice of that in the second game. While the third-person camera seems to have improved to a degree, there’s now a first-person mode that’ll make exploring tight corridors and underground spaces a breeze. No matter what you’re doing, you can change up your viewpoint to suit your needs. This is a small touch, but it’s something I’m sure fans of the original will be very appreciative of. If you had any doubts about Dragon Quest Builders 2 you can push them aside. 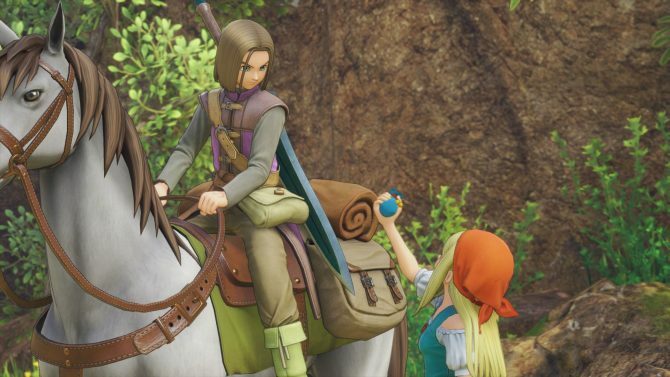 As far as what I’ve seen, I’m highly optimistic that this will continue to be a great series that’ll definitely help make the Dragon Quest series more popular in the west. 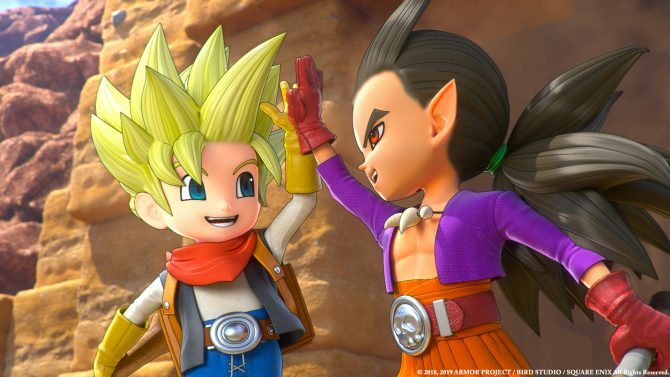 It’s all about doing right by your fanbase and making great games in the process, and Dragon Quest Builders 2 seems like it’s going to be a grand slam. Dragon Quest Builders 2 is coming to PS4 and Nintendo Switch on July 12, 2019.